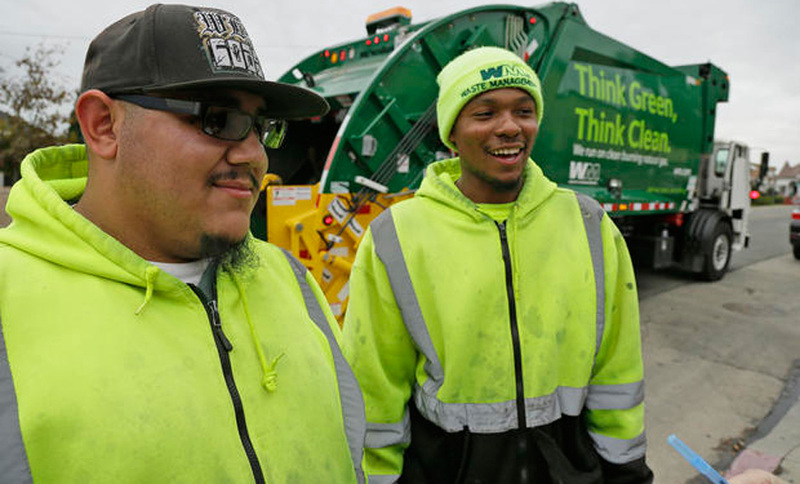 SANTA ROSA, Calif. (PAI) — A Teamsters win after a decade-long effort by solid waste workers in Santa Rosa, Calif., highlighted a spate of union victories that produced a total of at least 950 new members. But the victory in Santa Rosa at the Ratto Group, a non-union firm that low-balled its pay scales and paid scant attention to safety, was especially meaningful, as Ratto was undercutting other, unionized, solid waste hauler workers in Northern California, and specifically in Sonoma County. The wins, which ranged from California through Texas, Florida, South Dakota, Maine, Massachusetts and New York, were profiled in the latest Teamster magazine. The Ratto Group win alone brought almost 400 new Teamster members. Other drivers described equipment breakdowns, pressure to increase production, 12-13 hour workdays, and general meanness of company supervisors. Low pay was also a problem. Local 665 originally intended only to try to organize Ratto’s drivers again, despite prior failures. But in talking with them, local leaders realized the whole shop was ready. It also helped that Ratto was sold – and that its main customer, the city of Santa Rosa, audited Ratto and found problems the Teamsters highlighted for years, including rats in the warehouse. Drivers at Southern Glazer Wine and Spirits in Houston (59 workers) and Tampa (39 voted for Locals 988 and 79, respectively. Key issues at the beverage distributor were stable work rules, fair route assignments and fair pay and improved benefits, Local 988 President Robert Mele and Local 79 Business Agent John Sholtes said. By a 41-2 vote, drivers at Niagara Falls Coach Lines – yes, that Niagara Falls – joined Local 264. The unit has 50 drivers. Wages were the key issue: Niagara Falls drivers got the minimum wage with no benefits, while Teamster-represented drivers for other tourist bus lines serving the falls got good wages with benefits. Officers of the Belle Fourche, S.D., police department voted unanimously to join Local 120. The department has a chief, eight officers, an animal control officer and an administrative assistant. The chief is the only manager. Local 120 Business Agent James Hereen says he expects the city will bargain in good faith and the union and the city will find common ground. Airport screeners in the U.S. have unionized with the Government Employees, but the 85 pre-board screeners in Saskatoon, Saskatchewan, went with Teamsters Local 395. They join all the other pre-board screeners as Teamsters members in Canada’s prairie provinces. Teamsters Local 653 in Brockton, Mass., used to represent the 12 drivers at Liberty Bakery Kitchen. Now it has the firm’s other 88 workers, too. Unionizing to improve wages and working conditions were keys to the local’s success, packer Maria Veiga told Teamster. The eight workers at DHL Express’ bill processing and avionics facility in South Florida voted 7-1 to join Local 769. Local President Mike Scott moved quickly to include them in DHL’s national agreement with the union. Local 340 won recognition at the Shaw’s Supermarkets distribution center in Wells, Maine. The new unit has 81 members. The Teamsters lost a prior vote there, more than a decade ago, due to company labor law-breaking, National Labor Relations Board records show. “We had to overcome the company’s roadblocks in NLRB hearings before finally triggering a representation election,” Local 340 President Brett Miller said. As previously reported, Local 853 in the San Francisco Bay Area now represents 30 shuttle bus drivers for WeDriveU, the firm whose busses shuttle Silicon Valley workers from their homes to their jobs. While the workers at such high-tech firms at Yahoo, Facebook, eBay and Apple are well-paid, the drivers who pick them up and drop them off are not. Other groups of drivers have also unionized with Local 853, part of a campaign that has drawn wide community and labor support for the low-paid support workers of high-tech firms.